Work on Wisconsin’s next state budget gets fully underway today. 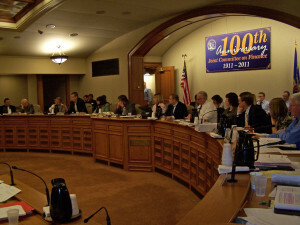 After holding hearings across the state this spring, members of the budget-writing Joint Finance Committee will meet at the Capitol this afternoon for the first of several executive sessions on the biennial spending plan. The process will take about two months for lawmakers to finalize the budget they will then vote on this summer. The committee will start out with votes on funding for the court system, state Division of Gaming, and a few other less controversial programs. More contentious votes, such as funding for the state’s transportation system, K-12 school funding, and a cut in University of Wisconsin tuition, are not expected to come up until much later in the process.